What is a parliamentary committee? Who are the members of the various committees? What are the different types of committees? How do committees gather information? What are the powers of standing committees? What are the roles of a committee’s chair and vice-chairs, and how are they chosen? What do the committee clerk and analyst do? How do Committees govern their work? What is a point of order in committee? Do committees publish a report of their proceedings? What is an in camera meeting? How to inform Members of Parliament about issues of concern to me? How to follow or attend a committee meeting? How to contribute to a committee’s work? How to search committee testimony? How was the image for each committee selected? Why do committees have acronyms and how are they selected? How to contact a committee? A committee of the House of Commons is a small group of Members created and empowered by the House to perform specific tasks, such as the examination of bills, estimates and other matters that relate to its specific mandate. A parliamentary committee may also consist of Members and Senators, as in the case of joint committees created by both houses of Parliament. There are many types of committees. They are distinguished by their membership, terms of reference and lifespan. Committees hold their meetings in buildings in the Parliamentary Precinct in Ottawa, but may occasionally meet elsewhere in Canada. Parliamentary committees are made up of Members, Senators or a combination of both, as is the case with joint committees. For House of Commons committees, the Standing Committee on Procedure and House Affairs establishes a list of members of the various standing committees at the start of each session and during the course of a session, if necessary. This list takes effect once it is approved by the House. As stipulated in the Standing Orders of the House of Commons, most standing committees have 10 members. Party representation on committees reflects the party standings in the House. A committee’s members are listed on the home page of its website or under the “Membership” tab. Standing committees : Created by the Standing Orders of the House of Commons, standing committees continue to exist from one session to another and from one Parliament to the next. They may study matters referred to them by the House and, within the limits of their mandates in the Standing Orders, may undertake studies on their own initiative. There are currently 24 standing committees of the House and 2 standing joint committees. With a few exceptions, these committees are empowered to study and report to the House on all matters relating to the mandate, management, organization and operation of the departments whose activities they oversee. In addition, some standing committees have specific mandates. Legislative committees : Established by the House for the sole purpose of drafting or reviewing proposed legislation, legislative committees cease to exist once they present their report to the House. Legislative committees are generally restricted to studying a bill referred to them by the House and presenting a report on it with or without amendments. Special committees : Created as needed by the House and charged with inquiring into a matter of particular importance, special committees are established by an order of reference (motion) adopted by the House that usually defines their mandate, powers and membership. Once they have presented their final report, special committees cease to exist. Joint committees : Established by both houses of Parliament, joint committees are composed of both Members and Senators. Joint committees may be standing committees, when they exist pursuant to the Standing Orders of the House of Commons and the Rules of the Senate, or special committees, when they are established by orders of reference (motions) of the House and of the Senate to study matters of great importance. Subcommittees : Created by an existing committee, usually a standing committee, a subcommittee reports to that committee. Committees establish subcommittees by adopting an order of reference (motion) defining their mandate, membership, powers and the other conditions governing their deliberations. Subcommittees may report only to their committee. Committees of the whole : This is the only type of committee made up of all the Members of the House of Commons. Each time the House resolves itself into a committee of the whole to deliberate on a specific matter, a new committee of the whole is created. Once it has completed its business, it ceases to exist. Meetings of committees of the whole are held in the House of Commons Chamber itself and are presided over by the Deputy Speaker, as Chair of Committees of the Whole, or by the Deputy Chair or Assistant Deputy Chair of Committees of the Whole. Their deliberations are considered House proceedings and are therefore not available on the Committees website. Liaison Committee : Established pursuant to the Standing Orders of the House of Commons, the Liaison Committee consists of all the chairs of the standing committees and the Members who are joint chairs of standing joint committees. The Liaison Committee is responsible for allocating the funds approved for committee business by the Board of Internal Economy. As small groups, committees efficiently perform work that would otherwise be difficult to accomplish in an assembly of more than 300 members. In essence, committees are responsible for reviewing in detail bills and existing legislation and for monitoring the activities of the machinery of government by conducting reviews of and inquiries into government programs and policies, expenditure reviews and reviews of appointments. In addition, on an almost daily basis, the House refers to its committees reports and documents that are tabled in the House by ministers or the Speaker of the House pursuant to the laws of Canada. These can be, for instance, the annual reports of departments and federal government organizations. In most cases, committees are free to decide whether or not to examine these reports, documents and appointments. In carrying out their business, committees may meet once or several times a week while the House is sitting or much less often when the House is adjourned for a long period. During their studies, committees can solicit opinions by hearing from witnesses—often experts—in order to pass along their comments and make recommendations in a report to the House. Committees can gather the information necessary for their studies in a number of ways, including by hearing testimony during meetings, accepting briefs (written opinions), requesting the production of documents, organizing round tables or visiting locations. Most often, committees gather information (evidence) on a particular subject by hearing from witnesses and consulting briefs. Witness : A person who appears before a committee to provide information or an opinion on a particular subject is a witness. By appearing, witnesses can develop or clarify their views while giving Members who sit on the committee the chance to ask them questions. While testifying, witnesses enjoy the same privilege of freedom of speech as Members and are therefore protected by parliamentary privilege. Witnesses at committees may include private citizens, experts, representatives of groups and organizations, lobbyists, public servants, ministers of the Crown and other elected officials. Committees generally select witnesses based on the type of study and the time available. Committee clerks invite witnesses on behalf of committees. Committees can also solicit written opinions and accept briefs. For more information about appearing as a witness, please consult the Guide for Witnesses Appearing Before House of Commons Committees. The past appearance of a particular witness can be found by using the witness search tool. Brief : For committee purposes, a brief is any document presenting the views of an individual, group, organization or government department with respect to a particular issue. Any individual or organization may send a brief to a House of Commons committee. For more information about submitting a brief to a committee, please consult the Guide for Submitting Briefs to House of Commons Committees. delegate to subcommittees all or any of their powers, except the power to report directly to the House. The Chair is the key figure on a committee. Chairs are so important that committees are considered properly constituted only when they have a chair. Committee chairs have procedural, administrative and representative responsibilities. They preside over committee meetings and oversee committee work, they recognize Members and others who wish to speak at these meetings and they ensure that the committee’s rules are respected and that order and decorum are maintained. Chairs call committee meetings and decide on their agendas. Chairs also submit budget requests approved by their committee to the Liaison Committee or the Board of Internal Economy. Along with the committee clerk, chairs manage the various budgets allotted to their committee. In addition, chairs are their committee’s main spokesperson to parliamentary colleagues, the media and civil society. Chairs also sign committee correspondence and committee reports to certify their content. They also normally present committee reports to the House. As for vice-chairs, they usually preside over meetings, or parts of meetings, when the Chair is absent. While presiding, they have the same authority as the Chair to maintain order and decorum. Occasionally, vice-chairs may play a role outside committee meetings, at the request of the Chair. For example, they may present a committee report in the House in the Chair’s absence. The methods of designating chairs and vice-chairs vary with the type of committee. In most cases, they are elected by the members of the committee, but in others, third parties make the decision. The chairs and vice-chairs of standing committees are elected by the committee’s regular members. For the vast majority of standing committees, the Chair must be a Member of the government party, and the first Vice-Chair a Member of the Official Opposition. However, there are special provisions for certain standing committees: the Standing Orders require their chairs to be Members of the Official Opposition. The Chair of a legislative committee is not elected by its members but is selected by the Speaker of the House of Commons from a list of Members that is established by the Speaker based on the party standings and that includes the other presiding officers. The Chair of a legislative committee can be a Member of any party. Joint committees have two joint chairs, one Member and one Senator. If there is more than one candidate for a Chair or Vice-Chair position when these are chosen by the members of the committee, the election is conducted by secret ballot, as required by the Standing Orders of the House of Commons. Each committee is normally assisted by a committee clerk and an analyst. Committee clerk : The clerk is a professional from the House of Commons who serves as the committee’s procedural and administrative officer. The clerk is the committee’s principal advisor regarding parliamentary procedure. As a non-partisan and independent officer, the clerk provides advice to all committee members. The clerk also prepares the minutes of meetings and, following the instructions of the Chair, organizes the committee’s work and meetings. In particular, the clerk contacts witnesses whom the committee wishes to hear, and publishes and distributes notices of meetings and all meeting documentation. In addition, the clerk prepares the committee’s budget requests and assists the Chair in managing the committee’s finances. The clerk is also the main point of contact for enquiries from the general public, public officials and the media concerning the committee’s activities. Analyst : The Library of Parliament provides each committee with at least one analyst on request. Analysts are researchers who specialize in the subject area of their committee and act as resource persons for any substantive questions the committee may have. In addition, analysts provide briefing material to committee members and may identify potential witnesses and suggest possible lines of questioning for hearings. They also play an active role in the drafting of substantive reports. Like the committee clerks, analysts perform their duties in a non-partisan manner and are at the disposal of all committee members. Standing, special and legislative committees must comply with the Standing Orders of the House of Commons so far as may be applicable. In addition, as they begin their work during the first meetings of a parliamentary session, committees often find it useful to adopt a series of rules and practices in the form of motions to deal with items of day-to-day business, called “routine” motions. Since each committee is free to organize its work as it sees fit, there is no official list of routine motions which every committee must adopt. Routine motions may vary from one session of Parliament to another. A point of order can be raised at any time during a meeting where a Member is of the opinion that the Standing Orders of the House of Commons or a committee rule has been breached, or where the Member believes that usual practice has not been followed. The proceedings under way are temporarily suspended while the point of order is addressed. Every point of order must be considered by the Chair, who determines whether or not the point of order has merit. Generally, the Chair makes an immediate decision. However, where the point of order requires greater reflection or more extensive research, the Chair can take the matter under advisement and render a decision at a later time. the name of the committee clerk who drafted the minutes. Evidence : The Evidence is the transcript of the proceedings of a committee. The official version is posted on the Committees website within two weeks of the meeting. However, transcripts of in camera meetings are not published. Usually, a meeting or part of a meeting held in camera is confidential and only committee members, committee staff and invited witnesses may attend. Neither the public nor the media is permitted, the proceedings are not broadcast and the transcript is not released to the public. Minutes of in camera meetings are publicly available, but certain information usually found in the minutes of committee meetings is not included to preserve the confidentiality of the proceedings. On occasion, a committee may decide to hold an in camera meeting to deal with certain matters, consider a draft report or hear a confidential testimony. It is up to the committee to decide whether its proceedings should be held in public or in camera. Divulging any part of the proceedings of an in camera meeting may constitute a breach of parliamentary privilege. Should you have an interest in an issue that is under study by a committee or falls within the mandate of a committee, consult the “Contact” tab on the website of the committee in question to find its contact information. Should you wish to contact a member of a committee directly, you can find members’ contact information by clicking on their photograph on the home page of the committee or under the “Members” tab on the committee’s site. If you do not know which committee to contact regarding a specific issue, please consult the summaries of the committee mandates using the “Committee List” tab. If you need more specific detail on the mandate of a committee, consult the “About” tab on the committee’s website. Most standing committees normally meet twice a week while the House is sitting and rarely during long adjournments. Usually, committee members agree on a schedule based on a preestablished system of meeting room priority, and it is up to the Chair to convene a meeting. The Committee Meeting Schedule provides the usual meeting times for committees and is available on the “About Committees” tab of the Committees’ website. To view information on past and future meetings of a specific committee, consult the “Meetings” tab on that committee’s website. To find the upcoming meetings for all committees, consult the "Meetings” tab from the menu on the Committees Home page. Simply consult the parliamentary calendar to find out when the House of Commons is sitting. The public can generally attend public committee meetings. However, neither the public nor the media is allowed to attend in camera meetings. Committee meetings typically take place in meeting rooms in the Parliamentary Precinct, but from time to time committees meet elsewhere in Canada. For the latest schedule of committee meetings, and to check whether or not a meeting will be open to the public, please consult the “Meetings” tab. You can also follow committee meetings online through ParlVU, the House of Commons webcasting service. ParlVU provides users with live video streaming of televised House of Commons committee proceedings and live audio streaming of committee meetings that are open to the public. To learn about the various ways you can contribute to a committee’s work, please consult the “Participate” tab on the website. There are two search tools: Publication Search offers multiple ways of accessing and sharing information from committee Evidence as well as House of Commons Debates (Hansard) and Journals dating back to September 2001. The witness search tool can find specific past witness appearances before a committee. The objective of the image for the committee is to generally represent the mandate or subject area of the committee in order to provide a visual identity and help differentiate each committee throughout the website. Of course, many committees have broad mandates that cannot be captured in a single image. Therefore, for some committees, the selected image represents only a portion of their mandate and area of study. For some committee types, such as legislative committees and subcommittees on agenda and procedure, a generic image for all committees of that type is used. 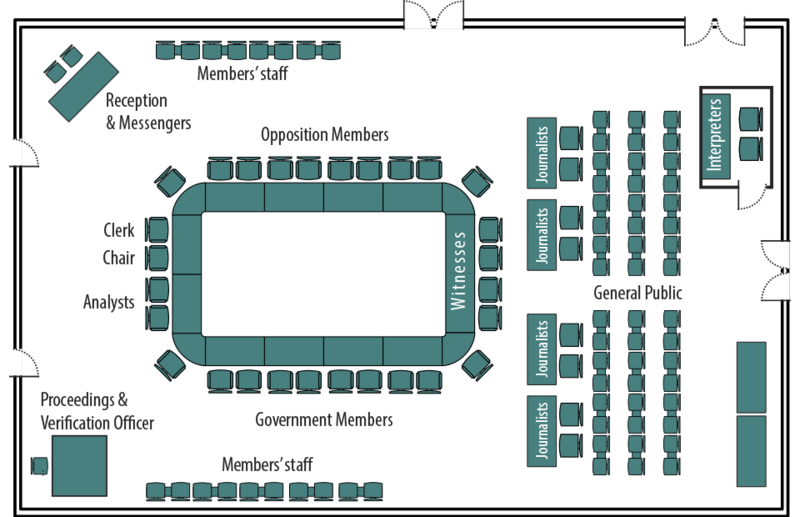 In addition, several committees do not have a unique image in earlier parliamentary sessions, because the use of images on the Committees website was not in place prior to the 42nd Parliament. Each committee and subcommittee has its own acronym. The name of several committees and subcommittees is quite long and acronyms are very useful to provide a shorter way to identify them, especially on modern communication tools, such as mobile devices. Acronyms are usually composed from letters contained in the name of the committee or subcommittee in both official languages. When the words in the name are similar in English and French, the acronym will usually be easy to recognize, for example FINA for the Standing Committee on Finance/Comité permanent des finances. When the words in the name are very different in both official languages, then the acronym will usually contain the first letters of one or two words from both languages, for example HESA for Standing Committee on Health/Comité permanent de la santé. Acronyms for legislative committees always contain the number of the bill the committee is studying, for example CC11 for the legislative committee on Bill C-11. Acronyms for subcommittees always begin with the letter S followed by other letters that represent the subject matter, or part thereof, of the subcommittee. Furthermore, several committees have a subcommittee on agenda and procedure and its acronym starts with the letter S (for subcommittee) followed by the first three letters of the main committee's acronym: SAGR for Subcommittee on Agenda and Procedure of the Standing Committee on Agriculture and Agri-Food (AGRI). You may contact a committee by email, telephone, mail or fax. Contact information for a specific committee can be found by consulting the “Contact” tab on the committee’s website.